If you're not watching The Goldbergs on ABC, you should be. It's like an updated version of The Wonder Years only set in 1980-something. Based loosely on the life of series creator Adam Goldberg (not this Adam Goldberg), it revolves around coming of age in a world filled with Star Wars, Transformers, Ghostbusters and Goonies. Oh, yeah, and Garbage Pail Kids too. 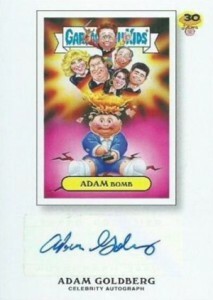 So it's only natural that The Goldbergs get honored with cards in 2015 Topps Garbage Pail Kids 30th Anniversary. 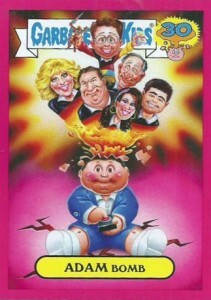 For months, Adam Goldberg has been using a GPK-ed version of his television family as his Twitter avatar. 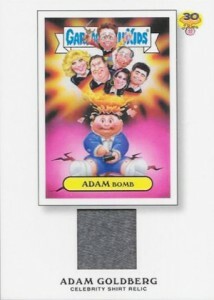 Appropriately, it's a spin on the iconic Adam Bomb with caricatures of the Goldbergs appearing in the mushroom cloud. That image, which was done by Joe Simko, has been used on card 2a in the checklist portion of the 30th Anniversary set. In addition to the base card, it also has several parallels. But that's not all that Adam Goldberg has in the product. The Fan Boys writer also has an autograph, relic card and one-of-one Autograph Pen Relic. Although several of the shirt relics have surfaced on eBay, only a couple of autographs did during its first week of release. The third season of The Goldbergs kicks off in the fall.